We knew Park Hill Village would be a hot spot when we opend in May– but we are thrilled that the rest of the community thinks the same! Read the recent article below, and see what all the Buzz is about! 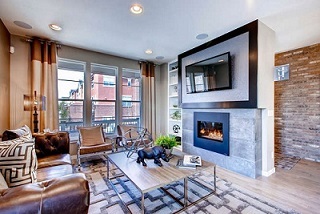 Since opening Park Hill Village in May, Denver homebuilder, Berkeley Homes, has seen 16 of 28 home sites sold to date. The hot-selling, urban-chic collection of single-family homes features a rarity in Denver: available home sites with open space and golf course views. Predictably, the community is down to 5 available golf-course home sites. Ranging from 1,645 to 1,807 square feet and priced from the high $300s to low $400s, Park Hill Village features contemporary and classic urban architecture in stylish 2-3 bedroom, single-family homes. “We believe buyers are drawn to the area because of the chance to have their own space in a single-family home while enjoying the openness that Park Hill Golf Course provides. It gives homeowners breathing room and a scenic view with some of our homes facing the Golf Course—a rare find in the city.” With only 5 remaining lots that face Park Hill Golf Course, buyers interested in securing one of these special view lots should act quickly. Park Hill Village can be found approximately one block east of Colorado Blvd. and 40th Ave., backing to Denver’s Park Hill Golf Course. The community features easy access to Denver’s commuter light-rail line between downtown Denver and Denver International Airport. A new light-rail stop is being built within a 5-minute walk of the community. It is slated to open in the spring of 2016. Park Hill Village homeowners also have convenient access to I-70 for trips to DIA, the mountains or to enjoy a ballgame and downtown Denver’s lively restaurants, nightlife and cultural scene. Adding to the locational benefits are the home and community amenities, which include: two-car attached garages, side-yard dog areas, spacious and open floor plans, inviting front porches, 200 square foot decks, optional finished basement flex spaces, beautiful interior appointments, community pool & fitness center and scenic views of the golf course from a handful of the remaining lots. Park Hill Village models can also be toured during the upcoming Parade of Homes, which runs from August 13th through Labor Day weekend. For more information or to join the interest list, visit Park Hill Village on the Berkeley Homes website at www.liveberkeley.com/park-hill-village.